(at center) Brian Mendes and Kaneza Schaal with the entire ensemble in place during “Moon of the Caribbees”. Image by Sara Krulwich. 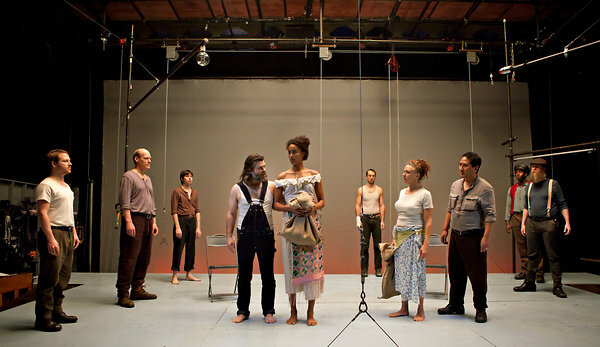 I am moved most by the middle of the three “Early Plays” presented in an intermission-less sequential assemblage in the Wooster Group – New York City Players collaborative production that concluded its extended run at St. Ann’s Warehouse this past weekend. All the pieces offer something to ponder — with almost motionless character action, the focus is on the words delivered, for the most part, in an accent apparently of the company’s own creation and almost without emotion. Intriguing, occasionally wearing, and at moments luminous. Moon of the Caribbees, pictured here, begins the production. On a ship docked after along voyage, exhausted sailors debate their condition, and fancy women come aboard onshore offering rum, other provisions, and their own company. Bound East for Cardiff, my musing mystical favorite of the three pieces, takes place at night aboard ship — with the stage in deep black save a few lanterns in rope assemblages approximating rigging, and primary action far upstage right in a ship bunk. Conversation between Yank (Brian Mendes) and Driscoll (Ari Fliakos), in darkness with a few nameless colleagues parading the rigging if your eyes are adept enough to discern them through the fog machine and low-wattage murk, keeping watch by night. Quiet, calm, intensely theatrical and (plotwise anyway) life-and-death kind of stuff. The final piece, The Long Voyage Home, is classical tragedy — hopes are dashed and some expectations fulfilled in a theatrically familiar world. Some our same characters are now ashore and wander through a bar run by Fat Joe (Jim Fletcher). O’Neill’s The Iceman Cometh and Anna Christie are never far from my mind — this world is close-quartered, rum-soaked, and slightly dangerous. The tragic story is revealed and enacted by our young Swedish shipmate Olson (Bobby McElver). Your heart hurts in the harsh light of the harsh world in which he lives and works, in which they all work. Pulleys and rigging and a few chairs and a bar ledge provide our world (set design by Jim Clayburgh and Elizabeth LeCompte). Key sound effects craft place and time, designed by Bobby McElver (our Swedish youth of the third piece). Traveling, traumas, deaths, drinks, ships, and oceans I am glad to have crossed.